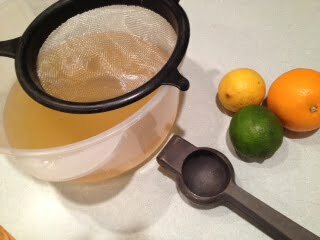 I looooove my latest water kefir variation: a refreshing citrus kefir soda. This reminds me of “Squirt”, which I used to love, only this one is a probiotic *healthy* beverage! 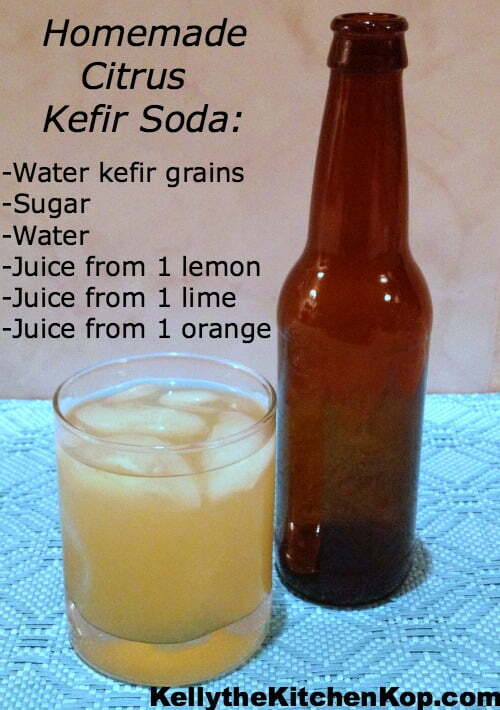 Here's the whole kefir soda recipe I use, I also posted it below. To make it into a citrus kefir soda, before the second ferment, I squeezed the juice of one lime, one lemon, and one orange into there (only because that's what I had in the fridge), and stirred. Then I bottled it and let it set for about 20-22 hours this time. That's how long it took to get fizzy. Funny how the timing is always changing on that. I also added a little bit more sugar – normally I add juice at this step but wanted to try only real juice. I used the lighter, more refined organic sugar for the first ferment this time. I'd read that this will make for a less bubbly brew, and I think that's why it took so much longer to get fizzy. They sure tasted good tonight with our grassfed burgers for dinner! What are your favorite kefir soda or kombucha variations? 5 Reasons Why I Love Kefir Soda More than Kombucha Tea. 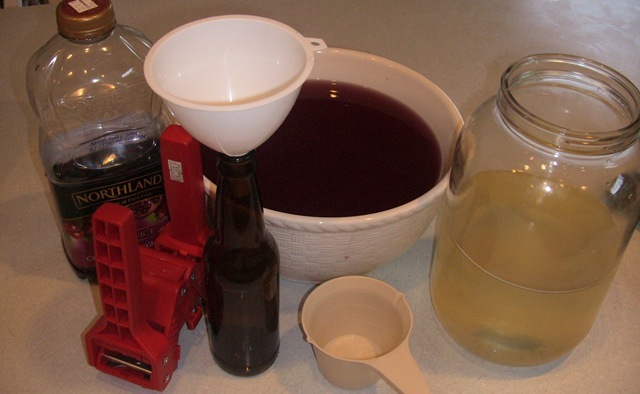 How Much Alcohol is in Kefir Soda? 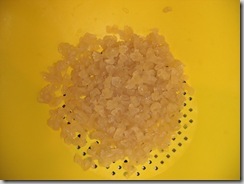 Read about when I killed my kefir grains. The first thing you’ll need to do is get some kefir grains. Also you may want to grab some flip-top/Grolsch-style bottles – perfect for bottling water kefir (soda) and kombucha. I got regular beer bottles from a local beer making store, but the flip tops would be nice so you could skip the capping step. To make kefir water: Dissolve 1/2 cup sugar in a little bit of very hot filtered water. I normally use the less refined sweeteners like organic palm sugar, but this time used a lighter colored organic sugar so the taste would come out lighter. I did notice it being less carbonated, though… Find the sugars I like here. 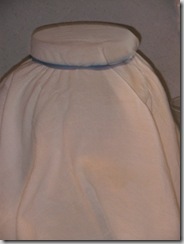 Add cool filtered water up to 2 quarts (1/2 of a 1 gallon jar). This will cool down your water to room temp – hot water will kill the grains. 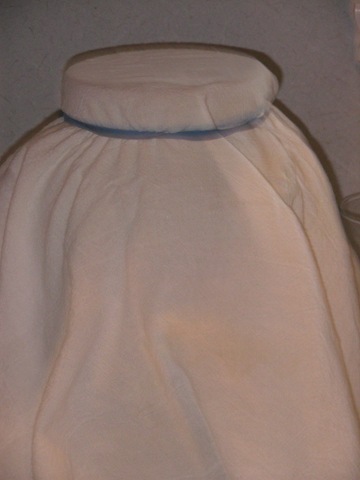 Add kefir grains, stir, and rubber band a cheesecloth over the top. Let sit on the counter for 24 hours to ferment (48 hours will result in less sugar). Make sure it’s away from any other ferments/cultures you may have going so they don’t mess each other up. Since reading this post from Julie about making sure your kefir soda has enough minerals, I’m going to start adding these to each batch: a small piece of egg shell, a small pinch of sea salt, and possibly also a small amount of organic molasses as directed in the post. Citrus fruit mentioned above OR 1 quart of any 100% juice you prefer – I’ve been using a pomegranate juice to make a red pop – which adds antioxidants! Bottles, caps, and capping tool (unless you use the flip top bottles mentioned above). Measuring cup or something similar to scoop and pour with. Here's where you add the juice from whatever citrus fruits you're using – organic is best as citrus is often on the dirty dozen list of produce with the most pesticides. Also add a little sugar to your own taste. Using a funnel, add the kefir soda up to just under the neck of the bottle and cap with your handy capping tool (very simple – see the other post for more details on capping). I get about 8 bottles from this batch. Note: to store your grains between uses, just keep them in sugar water in the fridge with a cover. Then when you’re ready to make another batch, strain and start from the beginning. We too love kefir soda. I just use our well water and don’t bother with warm water when adding the sugar. After the first fermentation, I bottle up the liquid with some grape juice and some water and let that sit out for about 24 hours. If it is very warm in the house (no AC) it might take just 12 hours. Then put it in the fridge till chilled. The weather took a cooler turn recently and I had to put my grains and bottles over the big metal heater with the pilot light. I’m going to pick up some cherry juice and blueberry juice today for some variety from the grape juice. We use flip top bottles too and I can tell the temps are changing. We came in last night to kefir everywhere. a liter bottler had exploded. kefir floor to ceiling and everywhere in between. glass all over. I couldn’t believe it. As for sugars we rotate them from time to time. Right now we are doing our secondary ferment with tart cherry juice. I haven’t tried kefir soda yet but I make kombucha all the time. I am not very fastidious with my process at all and have never had mold issues- maybe because I’m in Australia and it usually ferments pretty quickly. I love water kefir and have some brewing 90% of the time. I have found the coconut sap sugar makes my kefir grains go nuts!!! I have never seen such bubblies!! I have not tried a second ferment, I like it with just the one ferment. I wonder if I did a second ferment if it would get super-duper bubbly!! H-m-m-m-m, something to think about. Oh my goodness, Kelly, what a timely post. I’m new in making water kefir. I left mine out to get fizzy. When I went to open it, I got a “fountain” of kefir pouring out and ran to the sink. It took me a while to notice I was bleeding and so had gotten blood, as well as kefir, all over the place. Turns out, the kefir literally blew the top off the bottle when I opened it, and I’d cut my hand on the broken glass. I’m kind of traumatized by the experience, so now I just put it in the fridge after I remove the grains. Be careful out there! Youza! That’s the first time I’ve heard of a kefir soda injury! My favorite: with ginger, please! A lot of ginger. 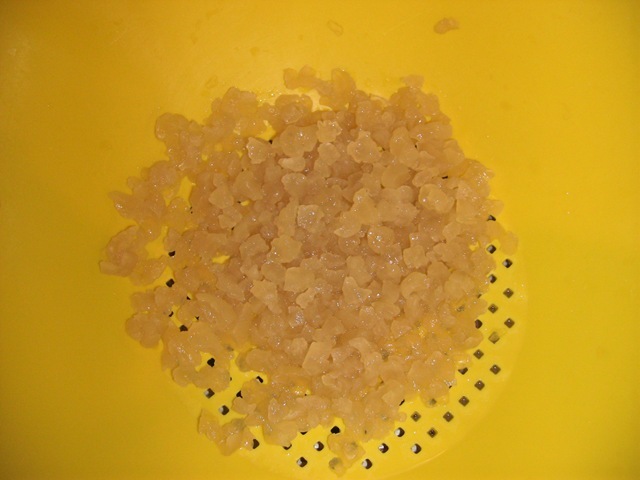 Kelly, do you think it’s safe for the water kefir grains to place them in water that has not be boiled and cooled. I’ve found that when I make kombucha my tea always molds when I place in water that only a portion has been boiled (for the tea to steep) with the remainder simply being filtered water. I was wondering if this would apply to water kefir as well. And I agree with another poster our favorite is adding bits of ginger for the second ferment. So delicious. We love a good variety! I get whatever real, organic juice is on sale and will sometimes juice my own fruits to add. My favorite is plain, but the kids love grape and grape-pomegranate. From time to time I’ll add chia seeds just before putting them in the fridge. That’s my youngest’s favorite kind! I used to dissolve the sugar in hot water, but now I just pour it into my two qts of cool water. No difference! I love fewer steps! I also add 10 drops of trace minerals from ConcenTrace since we have an RO filter on our water. I can’t wait to try this citrus version! Our favorite way to do water kefir is either ginger (chop up ginger root, put in bottle for second ferment) or ginger and cranberry. Even hubs, who is the soda drinker in the family, thinks ginger “healthy soda” is an acceptable substitute.